The BMW 3 series has set the benchmark as the most complete, compact executive and perhaps the most efficient, spacious and well-built saloon of all. 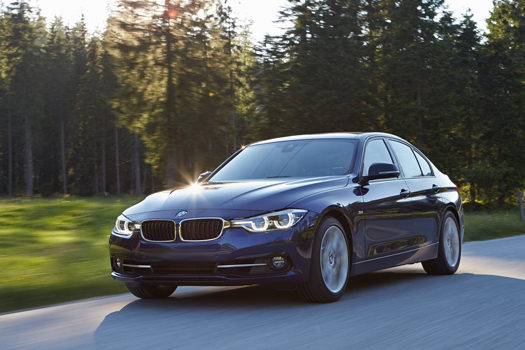 The BMW 3 series has been produced in sixth generation as a successor to the 2 series. It is an entry-level luxury saloon manufactured by the German automaker BMW. This car has been the exemplary in compact executive class for more than 40 years. While an ever-increasing number of models may swirl around the peripheries of the marquee, the BMW 3 Series has been BMW’s rock-solid nucleus since 1975. This car has won numerous awards throughout its history. The competition has raised in recent times, with the arrival of all –new Mercedes C-Class, Jaguar XE, Alfa Romeo Giulia and Audi A4 yet the face lifted 3 series does enough to keep near the top of the field. BMW builds some excellent engines and in its 3-series there’s a wide variety to choose from. There are three, four and six-cylinder engines available in 3 series, start with 316d 2.0-litre diesel engine, carries the 3 series from 0-62 m/h in 10.7 seconds, though performance of this engine is good overall but this version is a little bit slow. With 181bhp 320d 2.0-litre diesel offering a great blend of performance versus running costs. Fuel economy of this engine is 68.9m/g and is free to tax if you go for the fuel-economy optimised ED model. After these 2.0-litre engines, 3 series has introduced 3.0-litre turbocharged units. The performance kings in this powerful lineup consist of 330d and 335d X Drive, producing the huge amount of torque of 413lb/ft at 1500rpm and 465 lb/ft with 258 bhp for 330d and 313 bhp for 335d respectively. Horse power is the most common judge of a car’s power and performance and both of them produce the best amount of it with superb stability and sprint, so that’s why BMW 3 series reaches from0-62 m/h in less than five seconds. In BMW petrol engines, the range starts with the entry-level 318i SE, powered by a 134 bhp 1.5-litre three-cylinder turbocharged engine. Next up is the four-cylinder 2.0-litre turbocharged that comes in two forms .in the 320iit develops 181bhp and 199lb/ft of torque, while in the 328i produces 248 bhp and 258 lb/ft of torque. The 328i is a good replacement of 330i concerning fuel economy. A 3.0-litre six-cylinder is on the road in the form of 340i. It gets a new twin-scroll turbo-charged unit producing 326 bhp with more of torque than outgoing 335i it takes the car from 0-62m/h in just 5.0 seconds. As indulgent as it may sound, if you are in the market for a fast, petrol-powered 3 series, the M3 saloon is a far better option if you can afford it. The M3 is of course, the fastest car in this range thanks to its 425bhp 3.0litre straight-six cylinders. The combined power is 249bhp and takes the car from 0-62 m/h in 6.1seconds with top speed of 140m/h.